The other day, I was scrolling through my Facebook news feed and came across an article that stated the AMC show "Better Call Saul" tweeted out a not too subtle hint that actor Michael Mando will be playing Carnage in Spider-Man: Homecoming. I personally don't think that is going to happen. I have a feeling that we might see Cletus Kasady in the movie, and set up the character for a future Spider-Man film. Regardless of whether Carnage will be in the new movie, I figured we'd knock this key issue out anyway. Psychopath and serial killer, Cletus Kasady was a prison cellmate of Eddie Brock's. As most of the people reading this know, Eddie Brock was the second host of the alien symbiote, after Peter Parker, that would become the super villain Venom. The alien symbiote finds Eddie in prison, and bonds with him, once again becoming Venom. In his escape, a part of the alien symbiote is left behind and eventually bonds itself with Kasady, thus creating the Spawn of Venom, known to all as Carnage. 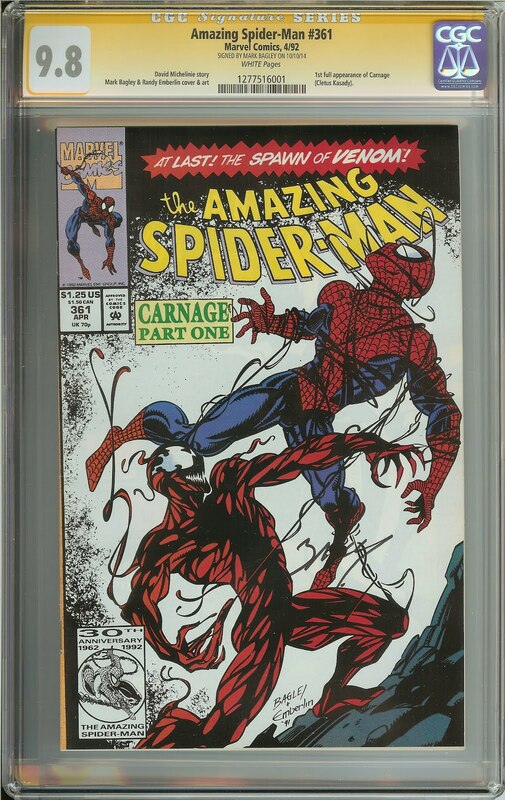 So, as I've stated in the key issue notes, this is the first full appearance of Carnage. In the previous issue, Amazing Spider-Man #360, Carnage makes himself known to the world in a one page cameo, but I'll get to that issue at a later date. There is a second printing of this issue out there. It is easily distinguishable from the first printing from its silver background. I've included a picture of it for reference. It's said that the second print had a much lower print run and is far more rare that the first print. I don't have any numbers for either printing, so it's just a matter of taking others word for it. However, there are currently only 231 copies of the second printing listed on the CGC census. Like a lot of comics printed in the early 90's, there are a lot of copies of this comic on the market, and you'll have no problem finding one. As we look at the census information for the first printing, there are 5,032 copies listed. If you count in CBCS and PGX graded copies, I'm sure the number is much much higher. Anyway, most of the copies taht are on the CGC census are in a very nice high grade. Two thirds of the comics are between 9.6 NM+ and 9.9 M.
So, with so many copies out there, what has that done for sales? Most grades have seen a small rise in value over the last year or so. 9.8 NM/M copies are nearing the $300 mark over the last couple of weeks, while 9.6 NM+ copies have started to consistently drop for over the $100 mark. There are a couple of weird sales for 9.8's that went for $1,000 each. I guess there's some "double cover" issues that made their way into stores. Those two sales are skewing the averages for 9.8's on GoCollect, but it seems like it didn't skew it too much. Lower grades have seen a little rise or stayed fairly even. They could be good investments, but for the most investment potential, the higher grades are the way to go, especially since prices for these comics aren't through the roof. I'm not sure if they ever really will be with the potential amount of copies that are out there, but I've seen stranger things happen. 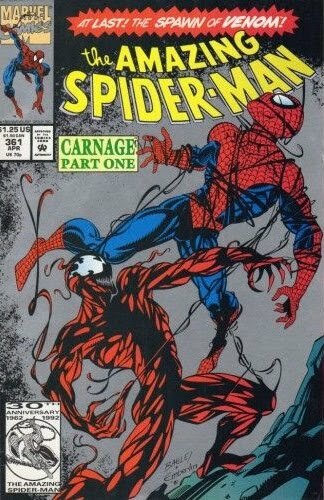 This isn't the first time there were rumors circulating that Carnage would make an appearance on the big screen. Before the fiasco that was The Amazing Spider-Man 2 made its way to theaters, Sony Pictures announced that they had a Venom / Carnage movie in the works. That announcement gave this comic a nice little boost in demand and value. I have a feeling that as this rumor spreads, and more people find out about it, we could see another one of those jumps in demand.